Arrival at Port Blair in the afternoon and transfer to respective Hotel. After lunch visit the National Memorial – Cellular Jail, Designed especially for solitary confinement it earned the Islands the dreaded name of Kala Pani. The Cellular Jail has a pride of place in India’s freedom struggle. Many a stalwart were imprisoned here. Declared a national memorial, this three storey prison constructed by Britishers in 1906, is a pilgrimage destination for freedom fighters. This colossal edifice has mutely witnessed the most treacherous of inhumane atrocities borne by the convicts, who were mostly freedom fighters. After Breakfast visit the Administrative Capital Prior to Independence from where the Britishers governed the entire A & N Islands , , the island is now under the Indian navy. ROSS ISLAND, It stands now as a ruin of the bygone days with the old structures almost in debris. There is a small museum named Smritika, it holds photographs and the other antiques of the Britishers relevant to these islands. The island is famous for friendly flocks of Deer and lush green walking trails. Later after Ross Island we sail to North Bay – also Known as Coral Island. Here one can enjoy the Glass Bottom Ride & Snorkeling / Sea Walk / Scuba Diving at additional Cost (Optional) to explore the Coral reefs underneath. Return back to Port Blair. Stay Overnight stay in Port Blair. 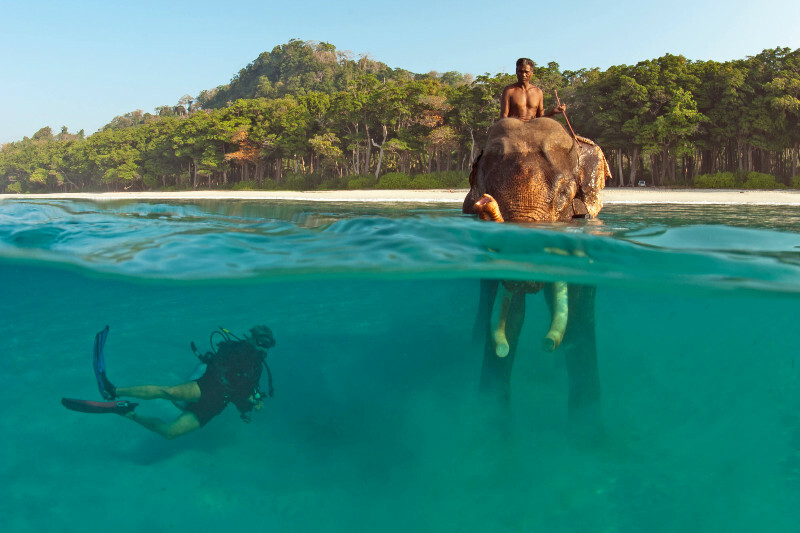 After breakfast at the Hotel, we will proceed to Elephant beach (Optional Snorkeling at Elephant Beach at a supplement Cost)in a sharing fiber speed boat. Just 30 Minutes by Boat, This beach offers snorkelers calm blue shallow waters and is the perfect spot for beginner snorkelers. It’s also a great place to just spend time lazing on the beach. The beach is very scenic with fallen trees and white sand giving the photographer some beautiful pictures to take back home. The reef here starts very close to shore at a depth of about 1 metre. The large reef is mostly made up of hard coral and has plenty of marine life. Later drop back to Hotel. Stay Overnight in Havelock. After Breakfast proceed for Chidiya Tapu– The Southernmost tip of South Andaman bout 31 kms from Port Blair- generally known as the Bird Island covered with lush green mangroves and beautiful beach with breath taking sunset – all of which creates a mesmerizing environment. Optional activities – Swimming, Trekking & Picnic. . Thereafter Drop to Airport. Return home with memories of a wonderful holiday.